’Tis the season to celebrate holiday baking, and the best recipes are the ones that double as gifts. Whether you're throwing a party for family and friends or searching for the perfect hostess gift, everyone appreciates a homemade, edible treat from the heart of your kitchen. This holiday season, involve the kids and surprise Santa with an irresistible plate of confections that goes beyond just cookies. From pretzel snacks and cornflake wreaths to fortune cookies and apple pie, the Town&Gown staff shares their favorite festive indulgences and holiday traditions. Scroll to the bottom for all the recipes! All it takes is one bite and, instantly, Vince is transported back to his mother’s kitchen in Wisconsin. He recalls as a kid mixing up the ingredients for his mother’s Christmas sugar cookies and waiting impatiently as the dough chilled in the refrigerator. Vince, his brother, and sister would argue over whose turn it was to use the rolling pin, what shapes to cut out, and how much fun it was despite all the mess they made in the kitchen. Nowadays, Vince’s partner, Becky, has carried on the tradition of making the cookies to bring to parties during the holidays, creating new memories for everyone lucky enough to receive these buttery-sweet treats. These quick and simple-to-make pretzel hugs are a perfect cooking activity to enjoy with a 3-year-old. Tiara’s son, Owen, enjoyed unwrapping all the Hershey kisses and placing them on the pretzels. After they were heated in the oven, he had fun placing the M&Ms directly on top of the kisses and pushing them down to achieve the final look. Adeline takes pride in her Romanian heritage and explains that hospitality is at the core of her culture. During the holidays, her family continues many traditions centered on specific foods, and covrigei is a must to welcome friends into the home. Not only are they fun to make, but they are also a great complement for finger-food plates. Anyone who loves Rice Crispy Treats will love Cornflake Christmas Wreaths. Growing up, Laura would help her mom make these wreaths, adding the Red Hots candies for the finishing touch. Nowadays, she substitutes the candies with mini red M&Ms and makes them for holiday gatherings. In addition, she also makes decadent Oreo Snowball Truffles. These little, bite-sized desserts are surely a crowd-pleaser. Darren likes spicy food, so it’s fitting that he would adapt a jelly-filled sugar cookie recipe with a touch of spicy fruit preserve to heat up the taste buds. Make sure you have a glass of milk close by if you are brave enough to try this recipe, and please warn your guests! No holiday table is complete without apple pie. Everyone has their own variation to this basic recipe, but the debate begins when you ask if they would like it served with a slice of cheddar cheese. 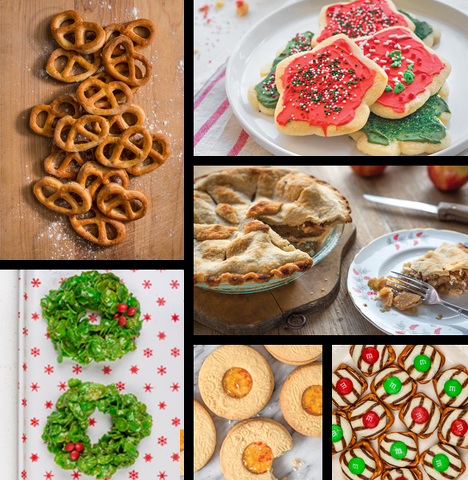 Popular in the Northeast and Midwest, proponents of apple pie served with cheese defend this tradition by pointing out other known sweet-savory combinations such as chocolate-covered pretzels. Some people bake cheese into the pie crust, some slip it into the apple filling, some melt it on top of the pie, and others leave it on the side of the plate. Mark’s wife, Paula, has always eaten apple pie with a slice of cheddar on the side of her plate, but Mark prefers to skip the cheese altogether and leave more room for pie. While not traditionally part of Chinese cuisine, the fortune cookie became common in Chinese restaurants after World War II. American customers expected some sort of dessert at the end of their meal, so Chinese-American restaurant owners whipped up these sweet and crisp cookies with a clever thank-you and good-fortune message tucked inside. Writing personal holiday wishes for my homemade fortune cookies is a wonderful way to share the love and give the gift of good fortune. Open the bag of pretzels and remove all the unbroken ones. Place them on waxed paper-lined cookie sheets in a single layer. Unwrap hugs. Place one on each pretzel, repeat for an entire cookie sheet. Only do one type of candy per sheet, as the hugs melt much quicker than the kisses. Place cookie sheet in the preheated oven, bake for 4 minutes. Immediately upon removing from the oven, place one M&M on top of each pretzel-chocolate. Place cookie sheet in freezer for 8-10 minutes, to allow chocolate to set. *You can also use regular Hershey kisses, just adjust the oven time to 5-6 minutes. Melt the butter in a large saucepan over low heat. Add the marshmallows to the melted butter and stir constantly with a wooden spoon until the mixture is smooth. Add the green food coloring and the vanilla extract, stirring to combine. Add the cornflakes and stir the mixture constantly until the cornflakes are evenly coated. Place a large piece of parchment paper on the counter or a cookie sheet and spray it lightly with cooking spray. Form the cornflake mixture into wreaths by making a ball of the cornflake mixture and slowly inserting your thumb in the center to create a small hole. While the cornflakes are still warm, place the mini red M&Ms atop the wreaths for garnish. Let cool for a half hour and they should hold their shape! Mix together your cream cheese and cookie crumbs until blended. Shape your mixture into 30-4 balls depending on size. Dip balls in melted white chocolate and immediately dip into bowl of sparkling sugar sprinkles. Cover any remaining Oreo mixture with melted white chocolate then quickly cover the entire ball with the sparkling sugar sprinkles. Place balls on parchment paper or wax paper and place back into the fridge until ready to serve! Place sliced apples in large bowl. Mix other ingredients in small bowl and sprinkle over apples. Let stand about 10 minutes until juice forms. Mix sifted flour with salt, Crisco, and ice cold water. Knead and make into 2 balls. Use rolling pin and make crusts 1-inch bigger than pie plate. Place one piece of crust on bottom of pie plate and place apples in; top apples with 6 small pats of butter. Put top crust on and pinch to seal sides; put 5 or 6 small slits in top of crust, and (optional) brush crust with milk, and sprinkle with a little sugar. Bake at 425 degrees for about 40 minutes. Draw circles using a wide-mouth lid on parchment paper. Turn the parchment paper over so you can see the three circles. With a spatula or spoon, spread batter to fit the circles on parchment paper, about 3 per cookie sheet. Bake in a preheated 350-degree oven until light golden brown, 7 to 8 minutes. Quickly remove the pan from the oven and one at time place a fortune across the center with a bit hanging out. Fold cookie circle in thirds over fortune with flaps only slightly overlapping each other. Turn-over and bring opposing sides together and pinch. Let cool. They can be tricky to make, so my advice is bake 2-3 cookies at a time because you have a matter of minutes as soon as they come out of the oven to fold them into shape before they harden. Make sure that the cookie batter is spread out evenly on the baking sheet. Wear cotton gloves to make it easier to handle and shape the hot cookies. Cream butter and sugar together in the bowl of your stand mixer, or in a large bowl. Beat in egg. Combine flour and baking powder. Blend dry ingredients into wet ingredients. Divide dough the dough in half. Roll one of the dough out to 1/8-inch thickness on a powdered sugar surface. Use a patterned rolling pin to emboss the dough. Roll the other dough out to 1/8-inch thickness on a powdered sugar surface, but don’t emboss the dough. For the embossed dough, use a small circle cutter to make a donut-hole in the center. Use a round cookie cutter to cut into simple circles, or use your favorite cookie cutter shapes. Place cut outs (not embossed) cookies on an ungreased baking sheet lined with parchment paper. Spoon a Tablespoon of spicy fruit preserve in the center of the not embossed cut outs. Bake for six to ten minutes or until cookies are light brown around the edges. Add the flour, baking powder, and salt to the food processor. Pulse to mix. Cut the butter into small cubes and add to the flour. Mix well. Add the egg yolks, sour cream, and crumbled feta and mix to incorporate well. Preheat the oven to 360 degrees. Divide the dough into 2 or 3 parts and keep the rest of the dough wrapped in cling film in the fridge, while you cut the first batch of pretzels or sticks. Roll the dough about 3 or 4 mm/ 0.12 – 0.15 inches thick on a lightly floured surface. Cut with the pretzel cutter if you have one. If not, cut the dough into stripes, about as long and thick as a finger. Place the pretzels or the sticks onto baking trays lined with baking paper. Brush them with the lightly beaten egg and sprinkle them with the seeds of your choice. For an even cheesier version you could sprinkle some of them with Parmesan as well. Bake for 12-15 minutes or until golden. Check the first batch repeatedly to make sure you get the baking time right, ovens are different and you don’t want to over bake the pretzels. While one batch is in the oven, cut the second batch and so on. You should have at least 2 baking trays/ cookie sheets, making the baking process quicker and easier. Leave the pretzels or sticks to cool before you transfer them. If you try to move them immediately after baking, they might break, so better leave them on the tray for about 5 to 10 minutes or so. Mix sugar and butter. Add egg and flavorings. Stir dry ingredients together and blend in. Divide dough into half and roll 3/16” thick on lightly floured pastry cloth. Bake 7-8 minutes or until delicately golden. Blend sugar, salt, and flavoring. Add cream to make easy spread. If desired, tint with a few drops of food coloring. Spread on cookie with a spatula.